Happy New Year, everyone! Can you believe we are already 2 weeks into 2014? As soon as registration for Amy’s Soap Challenge Club opened, I immediately signed up. I felt it was a good way to start blogging again for the New Year. Just like most people, December all the way to early January is always a busy time for me, but I didn’t expect nearly a month would pass in between my blog posts. Aside from the holiday gatherings split between Cebu and Manila, my husband and I also attended a wedding and a funeral. I was really excited to find out that January’s featured technique was the Taiwan Swirl. I have never even tried doing the simpler Mantra Swirl but I’ve always wanted to learn it. I’m so glad I chose to use the wooden slab mold over my usual log mold. 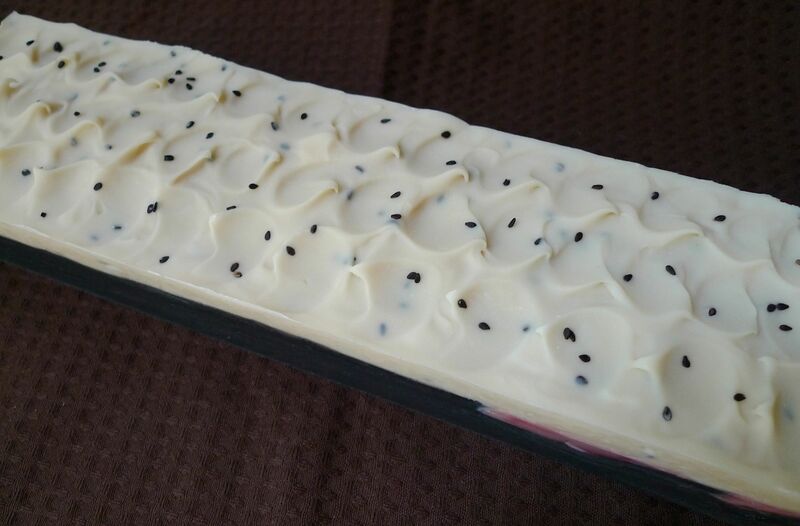 I didn’t want to have to split my soap horizontally and risk having no design for the bottom half. I think I am in love with the Taiwan Swirl. I find it so pretty and I can just stare at it for a long time. I will be honest though and say that it was not love at first sight. The first one I made had a yellow base, and pink and orange stripes. The pink and orange didn’t have enough contrast and ended up blending with one another, looking like it had no pattern. I know I should take photos of it, but with the weather wet and dreary, the more I am in no mood to do so. 23˚C (73˚F) is about as cold as it gets here and I am totally relishing every minute of it. I am in love with the scent too- a combination of neroli and grapefruit F.O.s. 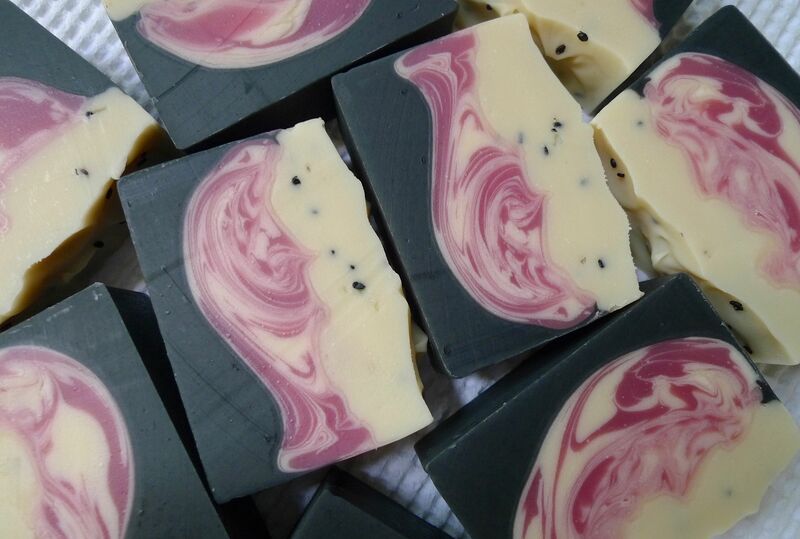 I made soap with the same fragrance last July and it still smells dynamite! I am calling it Puppy Love because it smells fresh and innocent, and reminds me of children’s cologne. 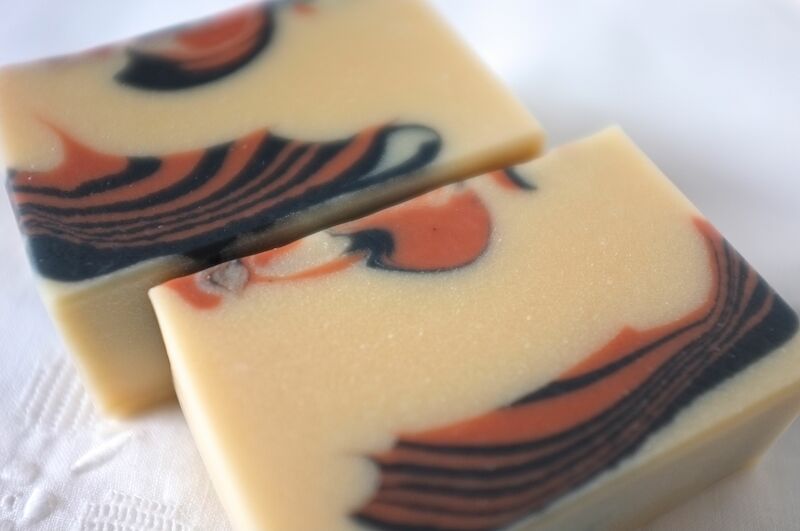 This entry was posted in Cold Process, Soap Challenge Club and tagged Soap Challenge Club, Taiwan Swirl on January 13, 2014 by soapjam. Before I left for Taipei last week, I made 2 attempts at the Dandelion Zebra Swirl. For my first attempt, I really like the color combination, but the soap thickened up a bit that’s why I didn’t get smooth clean zebra stripes. 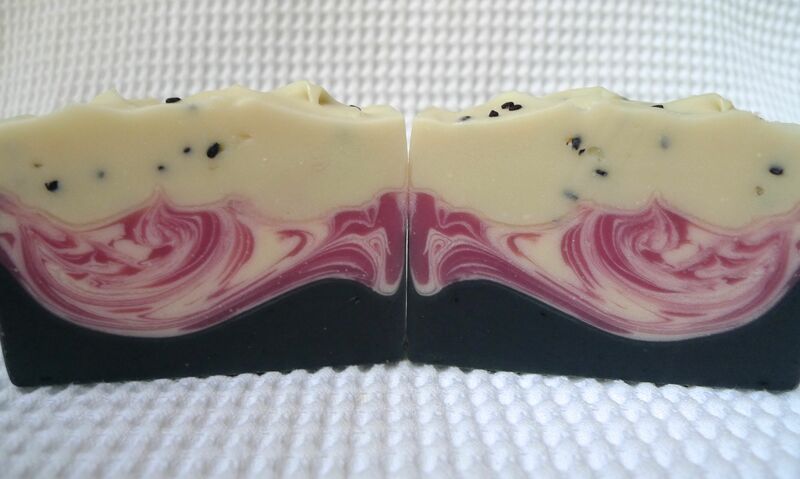 For the scent, I mixed Black Raspberry & Vanilla and Tangerine F.O.s – a really yummy combination! My second attempt does not even look like a Dandelion Zebra swirl! I used peppermint e.o. and a new fragrance called Fall Festival – a sweet and spicy scent – and it really accelerated trace. The soap batter barely slid down the board, more like a glop-glop, and when I was about to remove the board, it had already stuck to the soap batter. I had to yank it out and give the soap mold a good dose of hard banging. I am actually surprised that it does not have a lot of holes. When I got back from my trip the other day, I quickly made another attempt. I used [Capri Olivo] – correction: the name of the fragrance is OMG Olive – another new f.o. 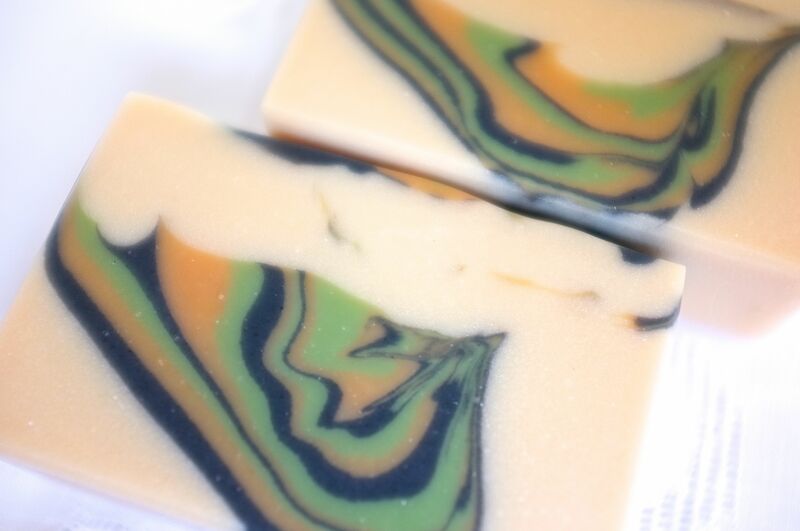 (I know I should not use new f.o.s for multi-colored soaps but I kinda like the thrill 🙂 ). It is a fresh, unisex, and spa-like fragrance. At a usage rate of 4% of my oils, the scent almost completely disappeared, but being the optimist, I am hoping it will come back! It is a very well-behaved f.o., allowing the soap to slide down with ease. I actually prefer the colors of my first attempt, but my third attempt shows the Dandelion Zebra Swirl technique better, so it is what I will be submitting for the contest. What do you think? This entry was posted in Cold Process, Perfumed Soap, Soap Challenge Club and tagged Dandelion Zebra, Soap Challenge Club on October 19, 2013 by soapjam. October’s technique for the Soap Challenge Club is the Dandelion Zebra Swirl, created by the über talented Vinvela Ebony, author of the Dandelion SeiFee blog. What makes the Dandelion Zebra Swirl unique is the use of a board that acts as a divider and as a “slide” for the zebra stripes that results in a suspended look. 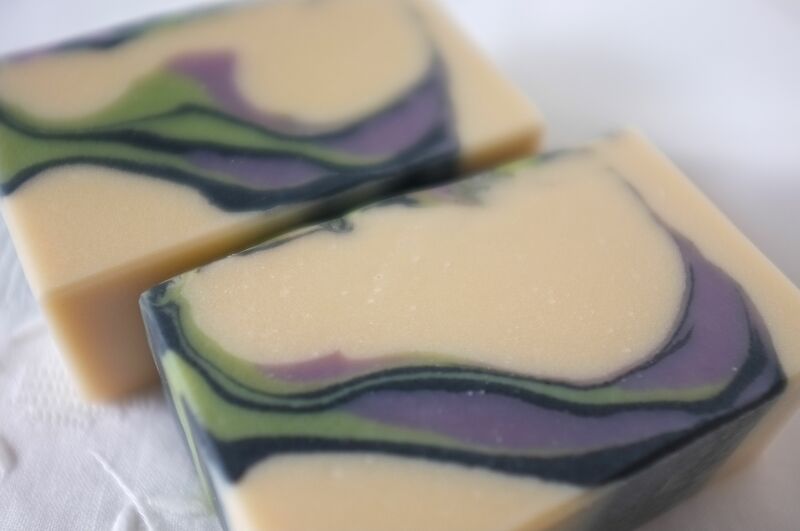 Before I signed up for this month’s soap challenge, I was inspired to make a simpler version of the tilting technique described by Maja of Diva Soap in the comment section of her post, Savanna (in response to Kirppu’s query). 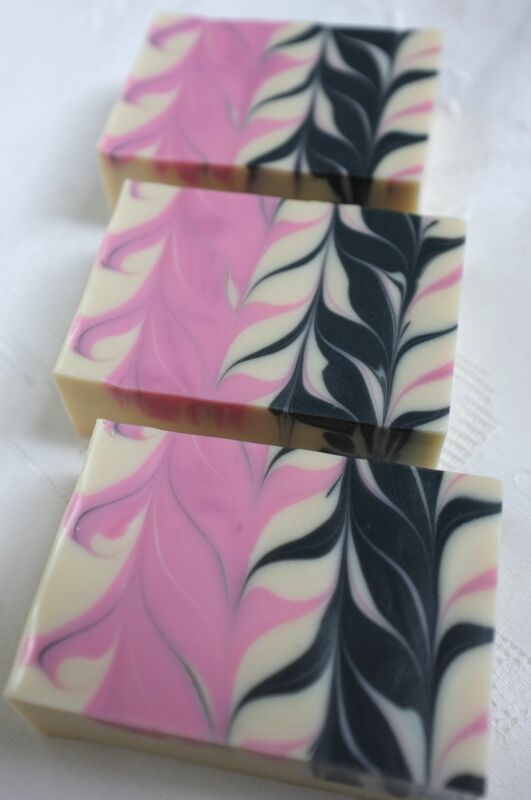 A few days later, I signed up for October’s soap challenge and proceeded to follow the tutorial given by Amy Warden. When I looked at the results, I felt it was hard to differentiate which soap used which technique. Here are three soaps I made and one did not use a board to achieve the stripes. Can you tell which one it is? This entry was posted in Cold Process, Perfumed Soap, Soap Challenge Club and tagged Dandelion Zebra, Soap Challenge Club, Tiger Stripe, Yogurt on October 8, 2013 by soapjam. 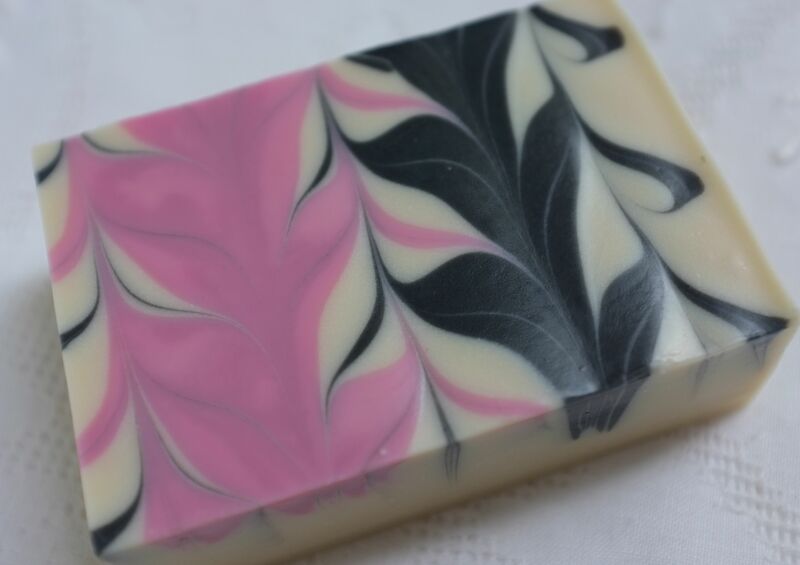 Ok, here it is, my entry to Amy Warden’s Soap Challenge Club! 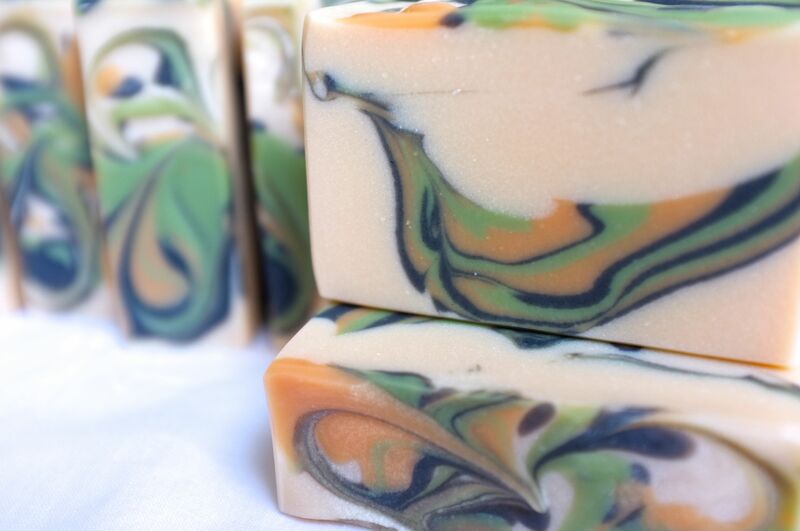 I’m so excited to be participating in my first ever soap challenge! The one I’m submitting is my second attempt at the Holly Swirl. My first and third tries looked interesting but did not look like a Holly Swirl. 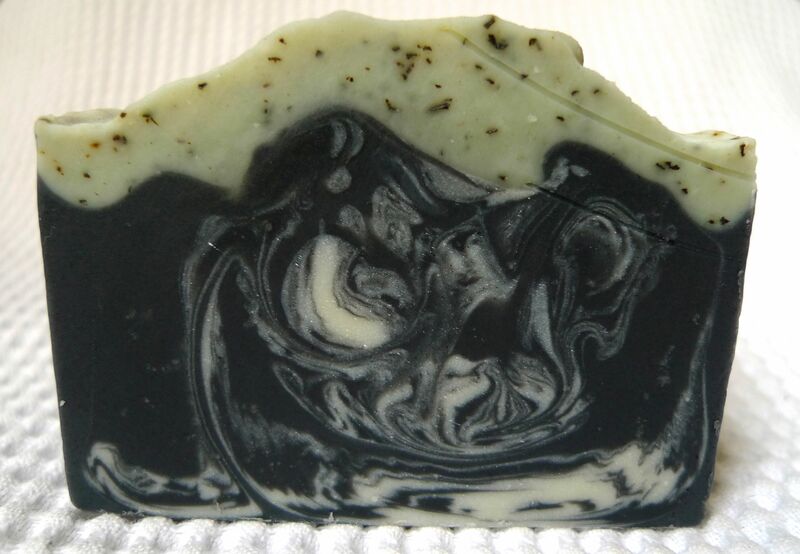 The black base is colored with charcoal and scented with an herbaceous green tea. 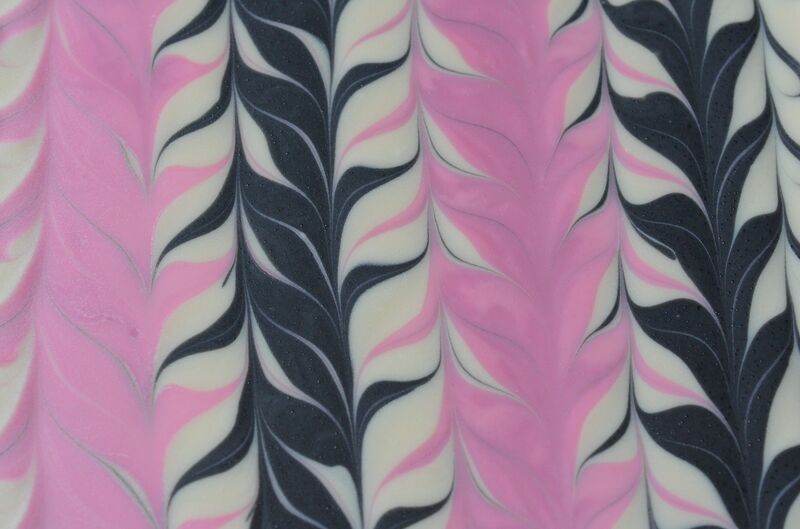 The pink swirl is red lab color with a drop of blue for a deeper pink, and it’s scented with Japanese cherry blossom. The cream part has a small amount of T.D. (I tend to be very light handed with it) and scented with green tea and pear. I find Japanese cherry blossom too powdery and floral for my taste, but mixed with green scents, it smells very pretty, delicate and feminine, with good staying power. Oils used were olive oil, coconut oil, rice bran oil, and castor oil. I’d say this combination is a slow to medium tracer. I noticed that without castor oil, trace is at a much slower pace. My inspiration for the design was a dragonfruit, that’s why I added a sprinkling of black sesame seeds. But because of the fragrance combination, I decided to name it Japanese Spring. While the sesame seeds add a nice touch, I would not use it again in the future because after a few days, it discolored the area around it. 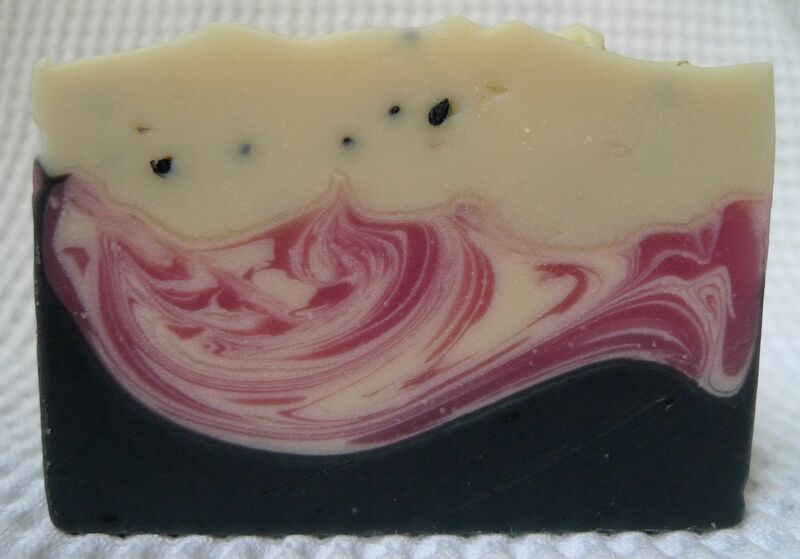 This entry was posted in Cold Process, Perfumed Soap, Soap Challenge Club and tagged Cold Process, Holly Swirl, Soap Challenge Club on August 15, 2013 by soapjam. It’s a Dog on My Soap! 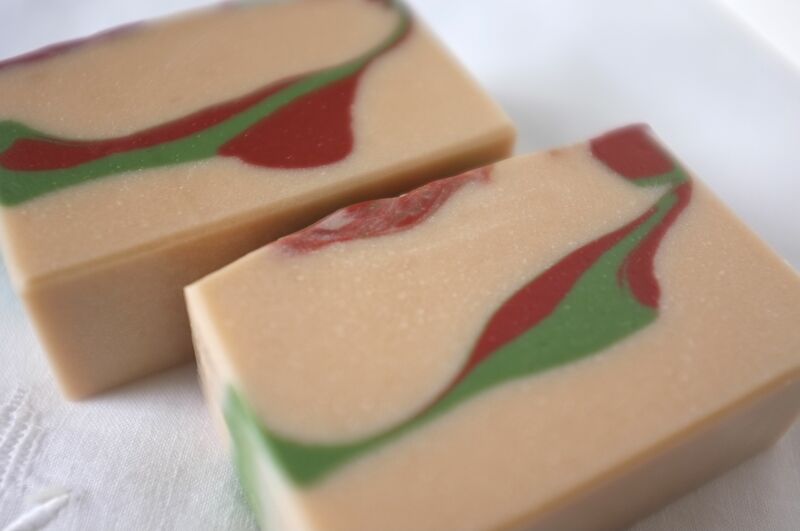 For the first time ever, I am joining Great Cakes Soapworks‘ Soap Challenge Club! 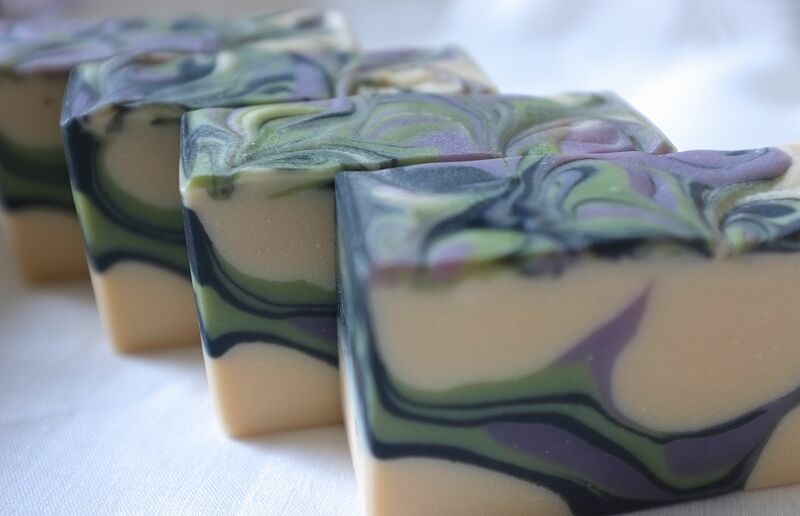 I have long admired the beautiful soaps that participants submit for the monthly contest, and it’s such a fun and exciting way to learn a new technique especially for beginners like me. I was so thrilled when the Holly Swirl was announced as the theme for this month. 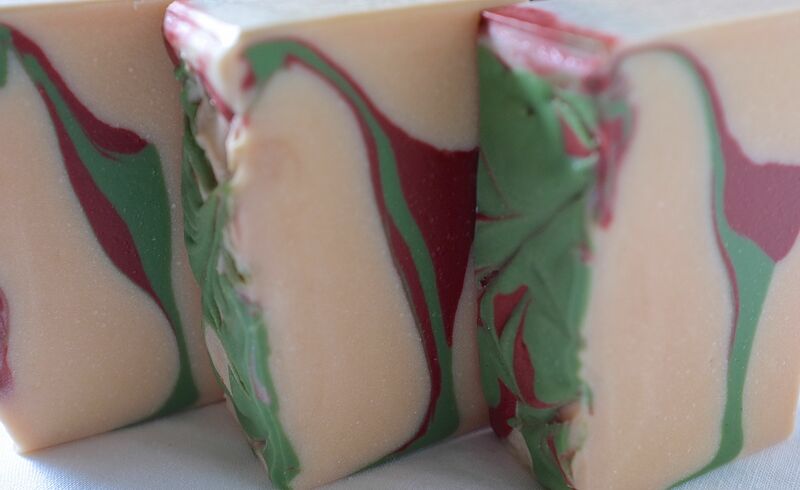 I am a great fan of Holly’s (Missouri River Soap) gorgeous soaps, and one of my favorites is her Green Apple and Rose. I have not personally tried it, but I just love the way it looks and sounds. I had watched her video on how she made it, but never got to do it until now. As you can see, my first attempt at the Holly Swirl was not very successful. I should have waited for a thicker trace before pouring the black and white swirl into the black base. I needed oils that were slow to trace, so I used olive, coconut and rice bran. It took forever to trace, even after I added all the colors (activated charcoal, TD, and green chrome oxide) and fragrance. I used BB’s Black Tea, the most well-behaved f.o. I have ever come across. I love the way it smells: strong smokey black tea balanced with the fresh scent of citrus and sweet raspberries. Do you see the image of a dog? 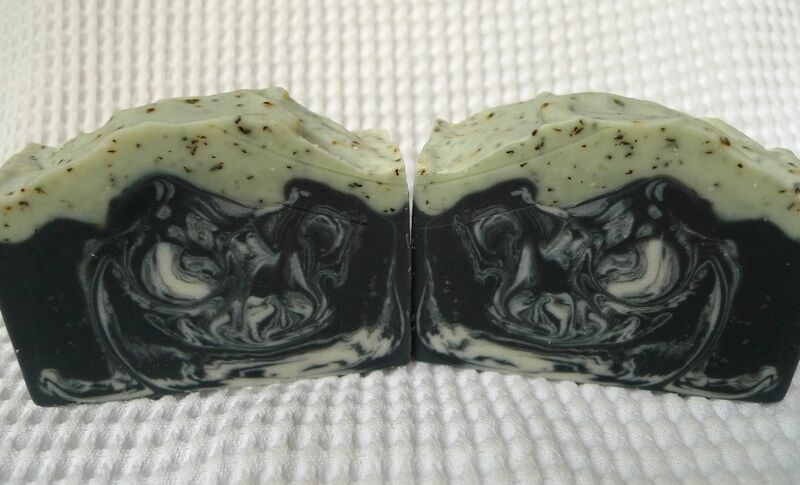 Mirrored image of a dog on Black & Green Tea Soap. This entry was posted in Cold Process, Perfumed Soap, Soap Challenge Club and tagged Black Tea, Cold Process, Green Tea, Holly Swirl, Soap Challenge Club on August 5, 2013 by soapjam.